Local laws determine how sewage waste must be handled. Septic professionals have the proper license and insurance to ensure they comply with regulations, which is especially important if your septic system needs a major repair or needs to be replaced. 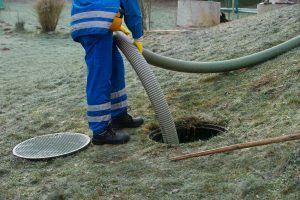 In addition to taking care of sewer and septic problems as they arise, a professional can perform routine maintenance that is likely to make your septic system work more efficiently and for longer. Maintenance often includes removing solids or sludge buildup that could cause clogs down the line. Between researching the problem, learning how to fix it, securing the proper equipment and doing the work, trying to repair your septic system alone will take days, and that’s if you don’t have any delays. Hiring someone saves you time since septic professionals already have the knowledge, experience and equipment necessary to do the job efficiently. Additionally, a professional is less likely to make a costly mistake, which means you’re probably saving money as well. The waste buildup in a sewage system is full of bacteria and chemicals that are likely to cause illness in someone not properly equipped for the job. By hiring a professional who has specialized tools and protective clothing, you ensure the safety of you and your family. Sewer and septic problems are a hassle but trying to repair the problem yourself is not the answer. Always call a septic professional to ensure safe, efficient and legal repairs to your home’s sewage system.